One of my birthday presents this year was a ticket to Miss Saigon! They had an extra matinee yesterday as the show was closed on Thursday due to filming of the Royal Variety Performance and the tickets were super cheap too! I absolutely adored it. The music/score is absolutely amazing and spine chilling and the cast had the most fantastic voices. I truly believe the 8th wonder of the world is Jon Jon Briones performing ‘The American Dream’. Miss Saigon is written by Claude-Michel Schönberg and Alain Boublil, the masterminds behind Les Misérables set in Saigon in 1975 on the backdrop of the Vietnam War, where we follow a young Vietnamise girl, Kim, who is abandoned by her American G.I lover, Chris. 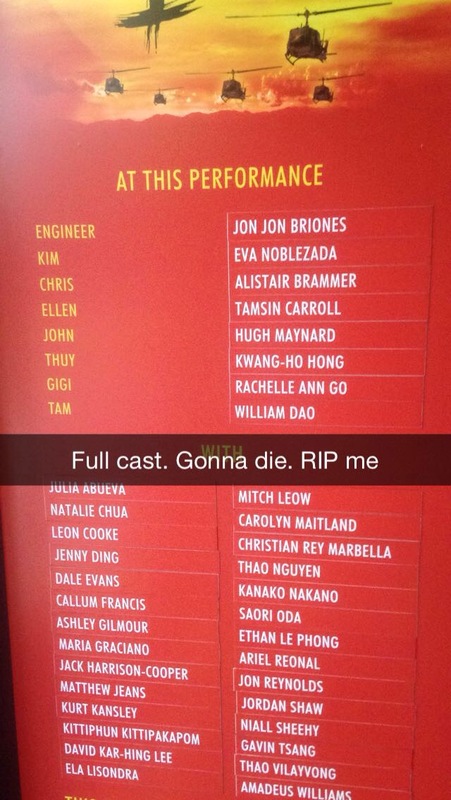 Eva Noblezada who plays Kim is EIGHTEEN YEARS OLD. SHE IS MY AGE (practically, give it a day). She was absolutely incredible. Like, I can smell an Olivier Award with her name on it. Her voice and acting range are simply stunning. The whole cast were amazing. Jon Jon Briones who plays The Engineer was born for the role. He’s played this role in so many productions it’s really like he was born to play him. The Engineer is such a vile character, he exploits women for money and all he cares about is going to America. And yet he’s one of those characters you love to hate. ‘The American Dream’ is, I guess what they call, “the 11 o’clock number.” It’s big, it’s flashy and show stopping. The surprise for me though was Alistair Brammer as Chris. I had seen him as Marius in Les Misérables a couple of years ago and he wasn’t particularly my favourite. But he is outstanding as Chris. I wouldn’t be surprised if he got an Olivier Award too. I did have a couple of issues though. While at times the choreography and set was cinematic, epic and beautiful, other times I felt the set felt very plain and like nothing was happening. I get there’s only so much you can do on a stage but if they could have a massive helicopter come down on the stage, I’m sure they could do a bit more. Nonetheless, it’s a brilliant production. I’d definitely recommend this to fans of Les Mis, I couldn’t help but parallel the two shows some of the time haha. It’s about the same length as Les Mis (2hr 50 minutes including a 20 minute interval). The cast are fantastic, I just wish it was more epic in scale than it was. Previous Previous post: Birthday Week + checking in! Next Next post: Sisterhood of the World Bloggers Award!